My little ceramic dishes provide inspiration each time they are used. Handcrafted of stoneware clay, this little tray is glazed in green. I designed the ceramic decal that has been fired into the glaze for lasting inspiration. 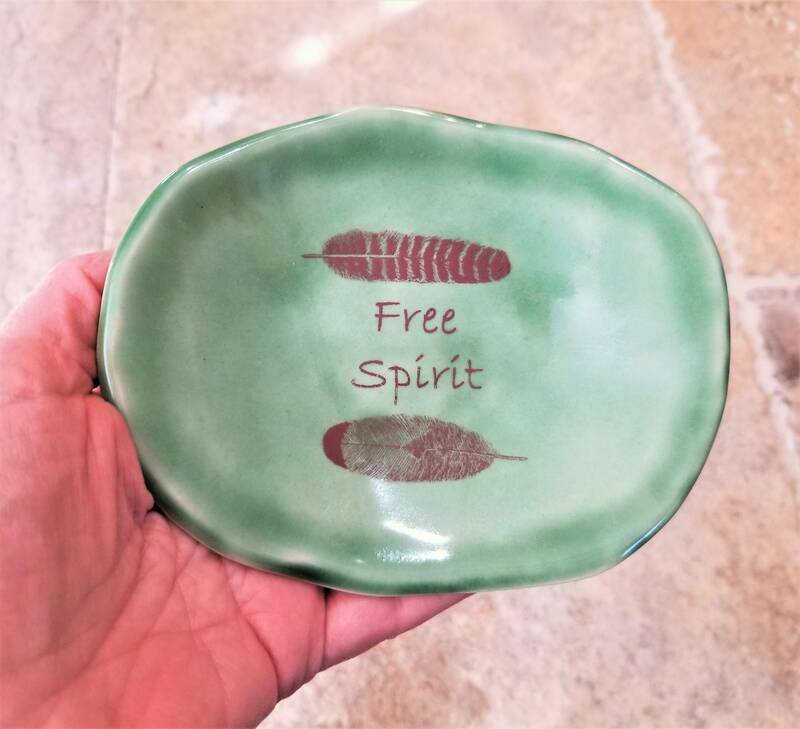 This dish reads, "Free Spirit", and features decorative feather images. It measures 5" x 4.5". Use it on your meditation altar or place it on a bathroom vanity, next to the kitchen sink, on your bedroom night stand to hold your rings and other jewelry. In the guest bathroom, it will hold 3 - 4 little guest soaps. Also makes a great tea bag holder! My little ceramic dishes are wonderful items to have on hand when you need an unexpected gift.